We have something in Israel that I think exists no where else in the world. It is Hebrew Book Week. Instituted in 1926 in Tel Aviv, today it has grown to dozens of open-air book fairs in most of the cities and towns. The radio and tv stations feature readings by authors, the bookstores provide deep discounts, the lucrative Sapir Prize is awarded to the book judged best of the year. 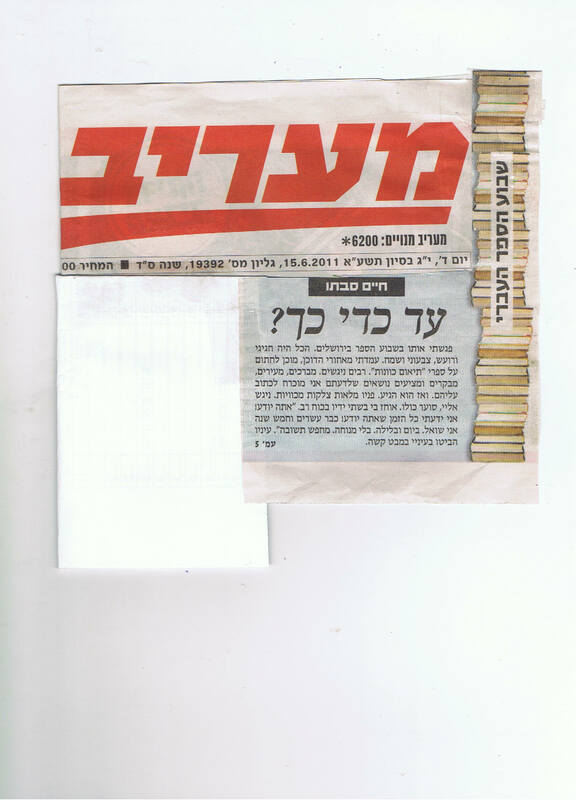 To celebrate the opening of Book Week, the front page of the Hebrew daily, Maariv, featured short stories by two authors about their experiences with Book Week. Where else would a book week be front-page news? One of the authors was Rabbi Haim Sabato known abroad for his fiction (the latest being From the Four Winds) and in Israel also for his Judaica writings and teaching at the yeshiva in Maale Adumim. He was the first Sapir Prize recipient 11 years ago. The fuzzy line separating life from fiction is the subject of his front page story. My translation follows. I met him during Hebrew Book Week in Jerusalem. With all the noise and color there was a festive atmosphere. And happy. I stood in my publisher’s booth signing my novel Adjusting Sights. There were many visitors to the booth. 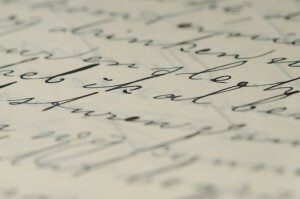 Some congratulating, some commenting, some criticizing, some proposing a subject about which I simply must write. Must. Others suggesting I add a chapter here or delete a paragraph there. I respond to each one. “An interesting idea.” “Something to consider.” Then he showed up. What could I say to him? I thought. I really did not know. What could I say? I was wondering why you titled your translation “It’s Just a Story?” It seemed to me from reading your translation (the only version of the original that I have access to is the short piece on the picture of the front page of Ma’ariv that illustrates your posting) that the point isn’t that it’s “just a story.” Rather, it seems that the main idea is the sometimes blurred line between fiction and reality, whether what was written was fiction or non-fiction. The who approached Rav Sabato about the burning tank incident was ignoring the fact that “Tiyum Kavanot” was a non-fiction memoir and the author wasn’t ‘omniscient’ like the author of fiction. And the main who approached Rav Sabato in the beit midrash was ignoring the fact that “K’Afapei Shachar” was a novel and the character Ezra Siman Tov was fictitious. In any case thank you for translating and posting this –I have never met Rav Sabato but I am a big fan based on his writings. Amazing how some people get so caught up that they can’t distinguish reality from non reality. I wonder if the TV ‘realkity’ shows contribute ot this or has it always been this wy. Previous story Why Bother Debating?